Former Florida Gov. Jeb Bush said today that if his children walked the streets of Phoenix they might look awfully suspicious to police. His wife Columba is from Mexico. Harvard professor Robert D. Putnam told the same crowd of city officials from across the country at the Denver Convention Center that his grandchildren might likewise draw suspicion. His daughter married a Latino man, he said. “I think it’s not right that they could be picked up just because of the way they look,” Putnam said. Bush and Putnam spoke and then fielded questions at a National League of Cities convention about immigration issues including the controversial Arizona immigration law. The law aims to detain, prosecute and deport illegal immigrants. The federal government has won an injunction blocking parts of the law, including a section requiring police to question the immigration status of those they suspect are in the country illegally. Arizona has appealed. A group of conservative lawmakers in Colorado is considering introducing an Arizona-style immigration bill in the legislature in January. My colleague Robert Putnam and former Florida Governor Jeb Bush had an Op-Ed in the July 3 Washington Post noting that kvetching about immigrant is a time-honored tradition. The grumbling, however, ignores the reality that immigrant integration has always taken decades and the fact that immigrants are integrating into the mainstream as fast if not faster than in the past. [We get a misleading impression since so many of the immigrants are newer to emigrating to the US, so a snapshot of Hispanics today, for example, masks the steady assimilation that is happening over time within any immigrant family.] The grumbling also ignores just how essential immigration is to the successful economic future for the U.S.
See “A better welcome for our nation’s immigrants” (Washington Post, 7/2/10). The op-ed contains a great quote by Benjamin Franklin from 1753 about the dire fears of German-American immigrants over-running the country and destroying our language and an amazing vignette about how Bethlehem Steel and the YMCA in Bethlehem, PA collaborated in the early 1900s to teach English free to thousands of immigrants in their town! Missing from the Op-Ed was the fact that even as late as the 1930s, Mario Cuomo, who went on to become the most gifted American public speaker of his generation, didn’t even speak any English until he started attending public school. The published Op-Ed also neglected to include that there is strong historical precedent for one of their policy recommendations — aid to communities impacted by the cost of immigration. Both pre- and post-World War II, the federal government provided “impact grants” for local school systems adversely impacted by a massive nationwide buildup of military bases dictated by the national interest, in the same way as higher levels of immigration today are in our national interest to keep the economy strong and deal with our fiscal pressures. For those interested in questions of the challenges of immigrant integration, we highly commend Outcasts United: An American Town, a Refugee Team, and One Woman’s Quest to Make a Difference. As my colleague, Robert Putnam, wrote in “E Pluribus Unum“, creating a capacious sense of ‘we’ will be critical to ensuring the long-term social success of this political enterprise of ours called the United States of America. Increased diversity is inevitable (due to continued migration and differential fertility rates), and a source of national strength as David Brooks points out in 4/6/2010 unbridledlly optimistic piece “Relax We’ll be Fine“. Partly related to immigration, this year more than half of all babies born in the U.S. will be non-white and for the U.S., effectively integrating newcomers socially and politically will be a challenging and real issue. 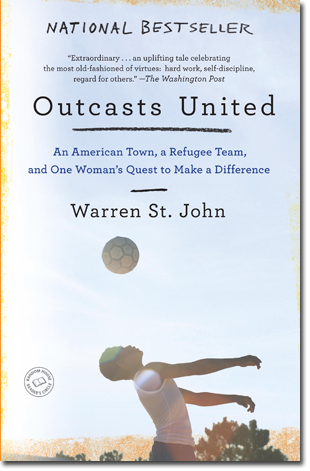 Outcasts United by Warren St. John chronicles a year for an international soccer team of 9-17 year old refugees (hiply called “The Fugees”), outside of Atlanta in Clarkston. Clarkston’s diversity has increased rapidly when it became a designated refugee resettlement area by federal authorities in the late 1980s, in a community unused to curries, hijabs or even street soccer. The feds found the small town size, lack of crime, access to public transportation to reach a downtown area, and cheap housing attractive. By 2007 there were 50 countries represented in the high school of the 7,100 person town. The book chronicles the Fugees’ interactions with each other — they are refugee children from 24 countries like Afghanistan, Bosnia, Burundi, Congo, Gambia, Iraq, Kosovo, Liberia, Somalia and Sudan — and their interactions with the surrounding community. 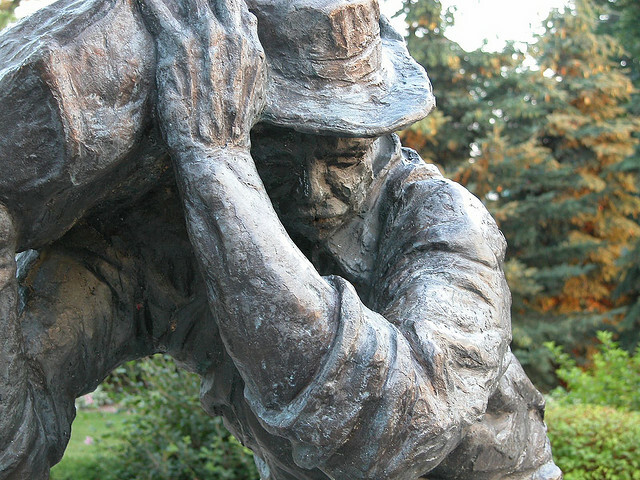 They often were victims of horrible atrocities in their home countries. Their inspiring female coach (Jordanian-American Luma Mufleh) strives to build a united team out of their differences and hold the team together as their members encounter individual obstacles. One team member was nicknamed “One Shoe” since he only had one oversized sneaker to wear. And the adversity was not just individual: town residents called them by racial epithets and the Clarkston Mayor Lee Swaney in Summer 2006 issued a decree outlawing soccer in the town park. Mayor Swaney said, referring to the town park, “There will be nothing but baseball down there as long as I am mayor.” One Afghan child was beaten up by Clarkston thugs who accused the boy of being a member of the Taliban since that was what the they knew of Afghanistan, when the reality was that the Afghan boy had emigrated when his father had been murdered by the Taliban. The book represents a microcosm of the challenges writ large of American immigrants and the surrounding community in building new identities that combine the richness of immigrants’ cultural upbringings but yet still enable community cohesion. The book, in a vivid style, raises many of the larger themes that were discussed in “E Pluribus Unum,” of civic engagement, community solidarity, social identity, we vs. they mentality, issues of distrust and withdrawal. I will have good behavior on and off the field. I will not do drugs. I will not drink alcohol. I will not get anyone pregnant. My hair will be shorter than Coach’s. I will listen to Coach. I want to be part of the Fugees! The Fugees lost every game of their opening season, but by the third season, thanks to returning players, they went undefeated. The Fugees are also described in this wonderful 1/21/07 NYT piece entitled “Refugees Find Hostility and Hope on Soccer Field.” A 7 minute NPR interview with author Warren St. John and Coach Luma is available here. At Amazon you can read the Introduction of the book. We also learned of interesting work happening out of the U.S. Citizenship and Immigration Services’ Office of Citizenship to spur greater civic engagement of immigrants, to help create mechanisms to teach them English more effectively and faster, and to work on immigrant integration. Jason Richwine had a recent post on The American blog (“A Smart Solution to the Diversity Dilemma“) suggesting that the answer to the short-term tensions Robert Putnam has observed, between diversity and immigration and levels of civic engagement, has a solution: admit smarter immigrants. First, a clarification…Jason Richwine is incorrect in asserting that Robert Putnam was unclear about whether to share these findings. We shared an early take on this finding immediately after we conducted the 2000 Social Capital Community Benchmark Survey. 1) Seth Hauser, “Education, Ability, and Civic Engagement in the Contemporary United States” Social Science Research 29, 556–582 (2000). Hauser found a modest independent affect of ability on voting and social participation, controlling for levels of education in GSS and Wisconsin Longitudinal Survey data: He found no such finding in ANES (American National Election Studies) data but this data has much weaker and less objective data on intelligence. Hauser concluded that in general the bivariate impact of ability on civic engagement comes from ability proxying for levels of education ultimately achieved. He also found that education was a stronger predictor of levels of civic engagement than ability. For “ability”, GSS had a measure of vocabulary; and WLS used Henmon–Nelson Test of Mental Ability. 2) Stephen Miller, ” Intelligence, Irrationality, and Civic Returns: Can Education Improve Democracy?” (Econ Dept., George Mason Univ.). Miller also used GSS data and also found that both education and intellectual ability in GSS predict voting, daily newspaper reading and tolerance of free speech. Ability did not have any independent effect on group membership and only had an effect through levels of education achieved. Had the effect of intelligence on social capital been much stronger than education (even controlling for education), it would suggest that there is less that one can do to alter one’s baseline level of civic engagement, and head us to more Calvinist notions of predestined civic engagement. 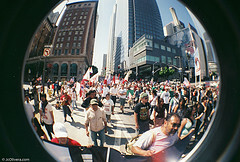 But since education is the bigger driver in Hauser’s findings, it suggests that we are keepers of our civic fate: although we may begin with differential likelihoods of getting engaged, these can be more than offset through additional education (which both provides us with useful skills for getting engaged — like organizing others, running a meeting, writing persuasive materials, making a speech etc. — and will make others more likely to ask us to get civicly engaged). I’ve previously written one entry on our research on diversity and social capital research here. This is a postscript of some interesting coda. First, there is another interesting story on this research by Erin Hoover Barnett in Oregonian called “More Diversity, Less Trust” (6/18/07). Second, there are two interesting posts about cognitive overload. First, this Dartmouth study from 2003 that explains how cognitive overload (mental stress) can be a factor in coping in more diverse environments as people try to censor bias. While Putnam’s E Pluribus Unum has already controlled for metropolitanism (by which we mean urbanism, like population density, your commuting time, census tract average community time, etc. ), and we find an effect of diversity independent of an effect of urbanism. But Simmel’s argument about overload and assault of the senses may still be the mechanism that we are uncovering that link diversity with lower levels of social capital. So the research finds a similar effect of diversity in Yakima, WA (a small city c. 71k outside any major metro areas) as in L.A or Houston.